Motorola came back to India about three months back. In those three months, it has launched three phones until now- Moto X, Moto G and now the latest Moto E.
All the phones have been runaway hits and Moto G was out of stock almost as soon as it was launched. Now, Moto E is enjoying the same adulation. The reviews are coming excellent and the price is such that for once, every review starts with excellent price before discussing any other feature. In a market of overpriced starting points, this is a breath of fresh air. Now, Motorola expects to cross half a million smartphone sales in India in a few days. This means, that in a market they just entered, they are already creating ripples. But that is from Motorola and they have really worked hard to get the results. 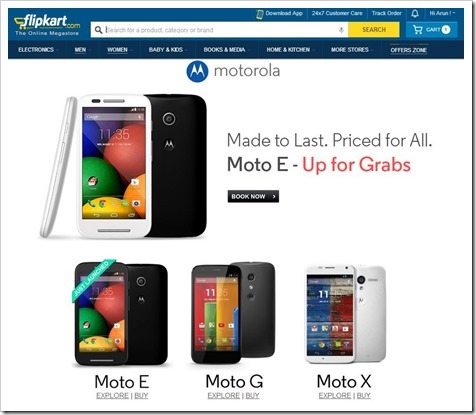 What interests me more is that Motorola has an exclusive deal with Flipkart and due to this, every phone that sells in India is going through Flipkart. With such amazing sales going on, Flipkart has not one but three assured products that are giving them constant revenue. Also, if the deal continues, maybe a phone or two more of Motorola also come only through Flipkart giving them profits abundant. The admirable thing is that while Amazon.in is growing at a huge pace and adding more verticals each day, Flipkart still managed to get a deal that benefits them exclusively. There is no doubt that Motorola will at some point want to expand their sales to other directions but right now, it is not in cards as such. The competition between Flipkart and Amazon is fierce. Amazon with its deep pockets and regular offers are increasingly becoming important. Their Happy Hours idea is excellent and Amazon is the company that brought one day delivery to India. Other than this, the increase in verticals has been very swift and its growth has been tremendous. Coming of Amazon has ushered the online retailing into frenzy with the word consolidation hanging over. It will happen in due course of time but Flipkart’s aggression is commendable. In online retailing, a lot of sale is about driving the customer to your site. If the same object is present at the same price on two sites, the one preferred by the customer in general wins. With tricks like Happy Hours, Amazon is trying to drive traffic towards itself and Flipkart is doing a great job defending its turf. They have already put in pipeline Flipkart’s First (an Amazon prime analogy) and with exclusive deals like Motorola’s they will continue to drive traffic to their site.